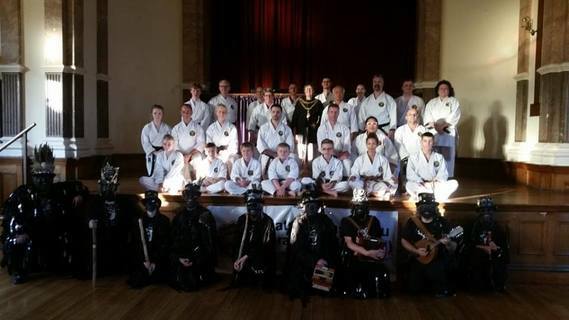 2015 has been another busy year for our Eastbourne Dojo, we attended the annual Sunshine Carnival. Parading down the Seafront, with members young and old performing kata along the way. This is a great chance for us to show the people of Eastbourne what we do and we always gain a few new members because of it! We were, once again, invited to perform at the annual Okinawa Day celebrations in London. 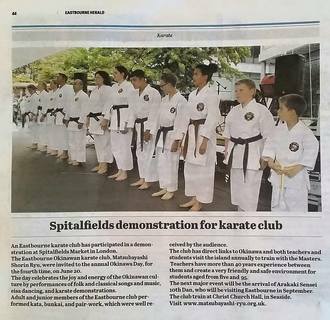 A group of us travelled up to Spitalfield Market and put on a fantastic display of Okinawan karate. There were lots of other displays of music and dancing during the day. 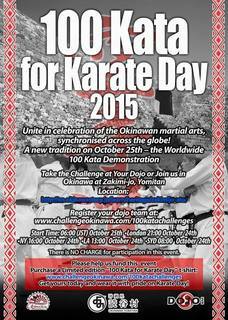 October 25th is World Karate Day and we join with Okinawa and the rest of the world and perform the "100 Kata" Due to the time difference between England and Okinawa, we start our 100 kata late evening of the 24th. This year the kata Wankan was performed 100 times in just under 2 hours. Well done to those who attended. The biggest event this year for the Dojo was the hosting of our Okinawan teacher, Arakaki Toshimitsu Sensei 10th Dan. Arakaki Sensei took training every evening for a week teaching us the ways of Okinawa. During the day, dojo members took Sensei to different places of interest around Sussex and London. On the final day of his visit, we were joined by Matsubayashi members from Ireland and Australia for a day long seminar, which finished with a demonstration at the Town Hall in front of the Mayor, we were joined by Hunters Moon, who displayed their quintessential Britishness. I'm sure 2016 will be just as busy! Why not come along and join us.